Akrasia is a single-player game that challenges game conventions and is intended to make the player think and reflect. It is based on the abstract concept of addiction, which is expressed metaphorically throughout the game. Spoiler Warning! The game is set in a maze that represents the mind. The maze has two states – a normal and a psychedelic state. To enter the game, the player has to collect a pill-shaped object and thus enters the game as "addict". From "chasing the dragon" and the experience of dependency to working your way through "cold turkey stage" where willpower is mapped onto navigation skills, this game models the essential dimensions of the addiction gestalt as identified by its creators. Depending on player behavior and choice, the game can have various outcomes that reflect this behavior. Someone who tries to shake the habit as quickly as possible will find herself in a different situation at the end of the game than someone who indulged in chasing the high. Unlike many other games where the player is forced to learn a specific behavior in order to win the game, this game gives the player a lot of freedom in regard to the realization of the game as text. The interpretation of the game is different depending on how the game is played, thus Akrasia is a prime example of a dynamic, player-dependent meaning generation. 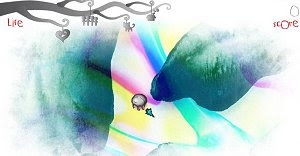 The game is meant to be played several times until all the connections between its various elements – the high-score, the life bar with its symbols, the two creatures that inhabit the maze in its two states, etc. – are decoded and its underlying meaning reveals itself. But although every single element in the game supports one specific reading, the beauty of Akrasia is its interpretative richness. All the elements in the game make sense in regard to one reading, but it is not the only possible one. The experiences that shall be conveyed in every single stage of the game do not only fit one experiential gestalt, but a variety of structurally similar experiences. Akrasia takes the notion of "meaningful games" to the next level. Play it, experience it and put on your thinking cap.